It seems like almost monthly there’s a new tool, or machine, or procedure being created by healthcare technology companies. For the majority of these new developments it is a good thing. These improvements in healthcare technology allow for greater access to more accurate and efficient ways to do things we’ve done for a long time. 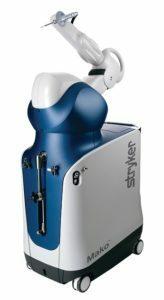 The Mako Robotic-Arm Assisted Surgery System is (relatively) new, and one may wonder: Is this just a new “thing” to use during surgery? Granted, using the Mako System is not for everyone. Your qualified physician can help determine what treatment is best for you. However, minimally invasive procedures like the Mako Surgical System provide several benefits. First, let me share just a little bit about the device. We actually have a page on our website that lines up how the Mako System works. You’ll even find a cool little video that illustrates the functionality, which you can find by clicking here. I will give a short synopsis about how it all goes down. We know that many people are hesitant or otherwise unsure about the use of robotics for surgery. However, the really nice thing about the Mako is that the robotic arm cannot move on its own. It has to be physically guided by the surgeon’s hand and helps the surgeon stay within parameters specified by the system. Of course, in the event that surgical decisions need to be made on the fly, Mako is flexible enough to allow changes to occur. You can think of the Mako System as the sweet spot between traditional surgeries and robotically controlled surgical instruments. It is a great tool to help surgeons become more effective and efficient in providing care. Additionally, we are the only facility in the area that has the Mako Surgery System, giving you a greater choice of treatment options here in Bryan/College Station. We would love for you to come and be a part of our patient family, who has rated us consistently higher than other facilities in the area. If you want to have an excellent patient experience, come and see us! 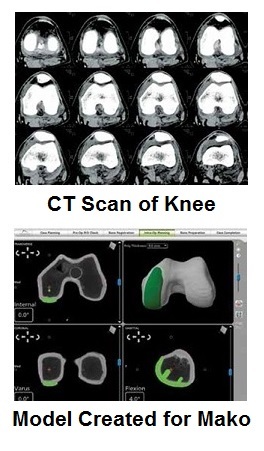 Are you considering knee surgery in the Brazos Valley? We can help you find a surgeon who can discuss if the Mako System is right for you. If you have any questions, feel free to reach out to us at 979-731-3930.